The UL Listed 1,900 mAh internal Li-ion Grade A battery has enough life to almost fully charge an iPhone, giving you about 8 hours of additional talk time. It features a 5V/1000mA USB output means that it charges at the same rate of most wall chargers. Includes a USB to Micro USB connecting cable which can recharge the battery backup or be used to charge up devices with a Micro USB input like Android Smartphones from Samsung®, Motorola®, HTC®, Nokia®, and others. This product passed UL Standards. This little battery backup will keep your mobile devices charged up! 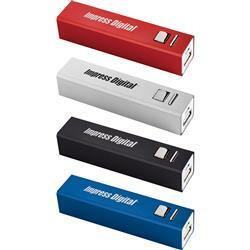 Great for conventions, tradeshows, executive and holiday gifts! 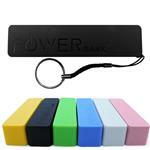 A great quality power bank. Available Imprint Options: Price includes a one color Color Print or Laser Engrave per location. UL Listed 1,900 mAh internal Li-ion Grade A batteryThis product passed UL Standards. Laser Engrave " looks white"